Austin Dillon and Kevin Harvick will lead the field to the flag stand. Dillon has been feeling sick all morning. He plans to start the race but Cole Custer has suited up as a backup driver. The field lines up in a five wide salute to the Calidornia racing fans. The start is next. Green flag, Austin Dillon gets the jump on the outside lane. They run three wide for 3rd. Harvick looks inside of Dillon. Hamlin looks inside both of both. Hamlin takes the lead. Lap 3, Almirola swings to the lead. Dillon has a look on the bottom. Almirola holds him off and opens a gap. Lap 10, Hamlin has closed the gap to the leader. He has run, Hamlin leads. Kyle Busch has joined them. He has a run off turn four. He heads to the apron through the tri-oval. Busch leads Hamlin back in turn one. Lap 27, Ryan Blaney begins the green flag pit cycle. Lap 29, Harvick, Keselowski and more are in. Lap 30, Hamlin and more are in. Lap 32, Kyle Busch pits from the lead. Lap 34, Byron pits from the lead. He was running 2 seconds per lap slower than the cars that pitted. The lead is handed back to Kyle Busch. Lap 40, Busch leads Hamlin by 1.7 seconds. Lap 50, Kyle Busch has the newest tires in the field. He’s driving away. 5 to go in stage 1, Austin Dillon has a flat tire. The caution is out. Hamlin, Stenhouse and Bowyer stay out. Every other lead lap car will head to the pit lane. It’s going to be a 1 lap shootout. Green, Hamlin leads into turn one. Busch is coming on the bottom. Stenhouse gets loose on the inside line and the field runs over him. The caution is back out. 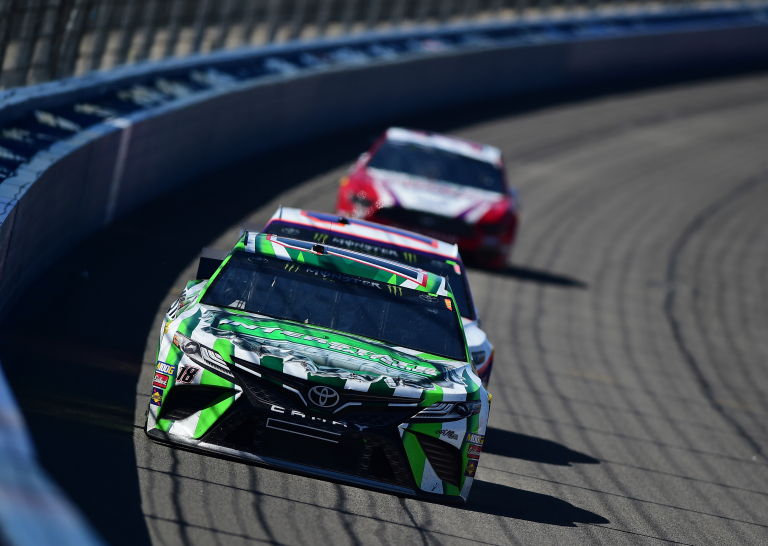 Kyle Busch wins stage 1 at Auto Club Speedway! Most stay out. Hamlin and others pit. Truex picked up major damage on that last caution. 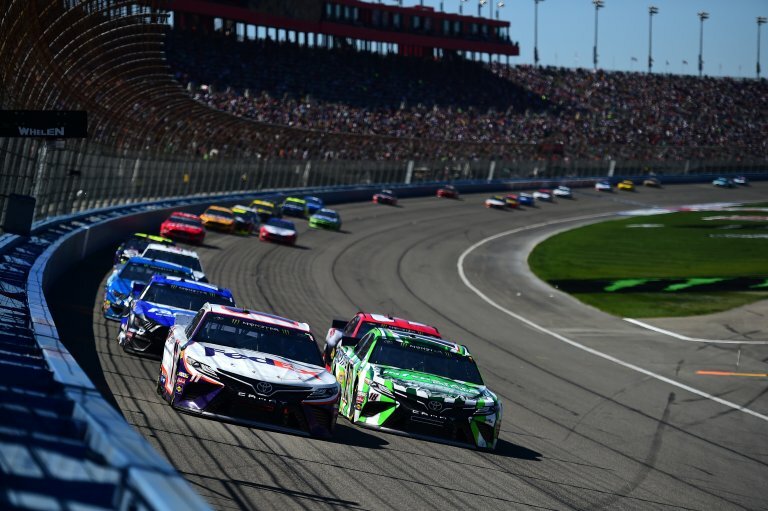 Green flag on stage 2, Kyle Busch leads by a half car length into turn one. Logano is clear off turn two, he swings to the wall off the corner. Kyle Busch crosses under him off turn two. Busch leads into turn three. They run three wide for 2nd. Lap 61, Busch gets loose off the corner. Logano takes the position. Busch fights back to reclaim the lead. Lap 85, Kyle Busch leads Logano by 2.6 seconds. Lap 90, Harvick and others head for the pit lane. Keselowski and more follow on lap 91. Lap 92, Logano is in. Lap 93, Kyle Busch pits from the lead. Busch cycles back to the lead. Lap 100, Kyle Busch leads Keselowski by 5 seconds. 8 to go in stage, Clint Bowyer heads for the pit lane. He was clipped in the left side door by Corey LaJoie and suffered damage. 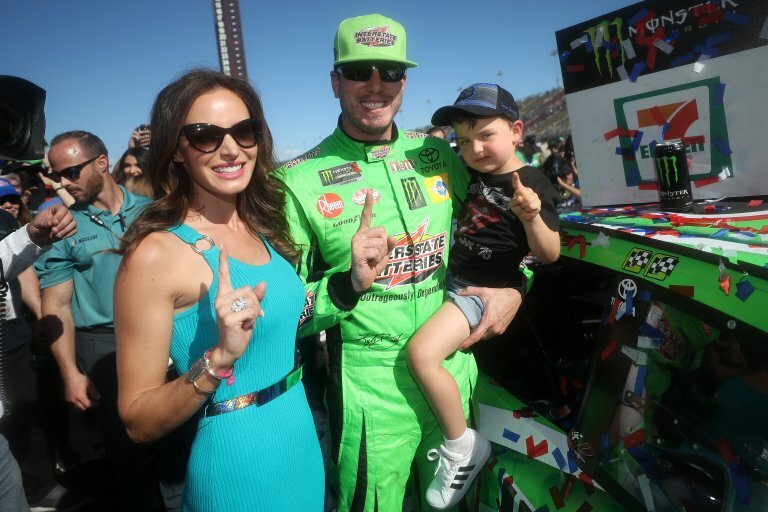 Kyle Busch wins stage two in the Auto Club 400! The field heads for the pit entry. Kyle Busch is first in and first off. Penalty: Busch and Hamlin are both caught speeding. They’ll head to the tail of the field. Keselowski and Harvick lead them to the restart. 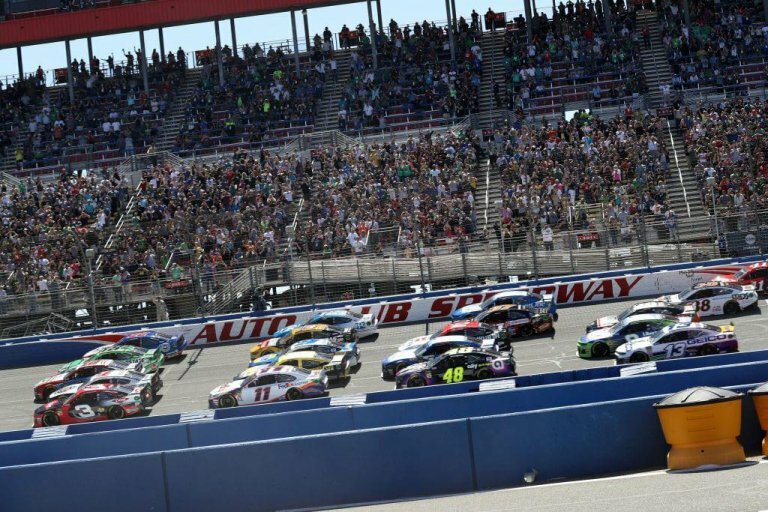 Green flag on stage 3, Keaelowski leads by a car length into turn one. Suarez goes all the way to the apron to throw a block into turm three. Kyle Busch has been 3 wide since the green. He’s flying through the field. 70 to go, he’s inside the top 15. 65 to go, Busch has cracked the top 5. It took him about 10 laps to come from the back to the front. 50 to go, Brad Keselowski leads Joey Logano by 4.6 seconds. 40 to go, Ryan Blaney and other begin the final green flag pit cycle. 39 to go, Keselowski pits from the lead. 37 to go, Bubba Wallace has a flat tire. Debris is all over the race track. Kyle Busch was the only car that hadn’t pitted. Kyle Busch heads for the pit lane. Keselowski, Logano and others return to the pit lane even though they just pitted. Ryan Blaney does not pit, he’ll lead them to green. Green, Keselowski is on the bumper of Busch on the inside lane. They’re clear of Blaney into turn one. Busch heads to the bottom. Keselowski heads for the middle. Keselowski gets to his right rear, he stalls Busch out and carries momentum to the lead off turn two! 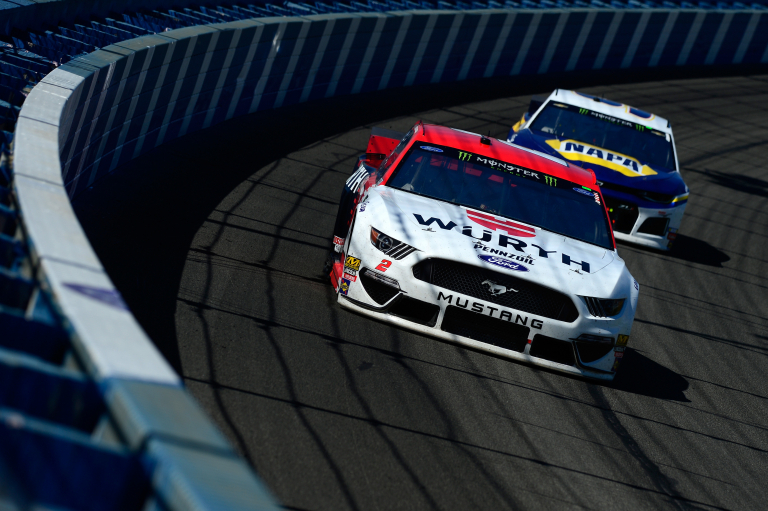 29 to go, Keselowski leads Logano and Harvick. Kyle Busch has fallen to 4th. 27 to go, Logano side drafts Keselowski down the back. They snake across the back stretch, trading side drafts. Logano is clear into turn three. That has allowed Busch to close. Busch has a run, he looks to the inside, clear. Kyle Busch returns to the lead. 15 to go, Busch leads Logano by 2.2 seconds. 7 to go, both leaders run inches from the outside wall. Busch is maintaining the gap. 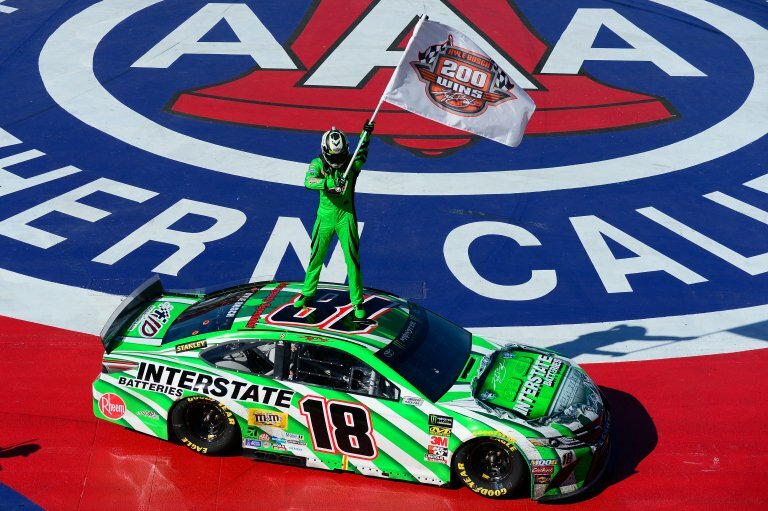 Kyle Busch wins at Auto Club Speedway! That’s win number 200, tying Richard Petty.